Career Programs – Information about careers, jobs, skills and more. Information about careers, jobs, skills and more. Interested in the Trades? If you are interested in participating in the Youth Explore Trades Sampler Program that is running in third trimester of the 2019/2020 school year, please see Susan Enns in room 311 to pick up an application package. Coast Mountain College is our YETS training-provider and only 16 seats are available- don’t delay, get your application in ASAP! 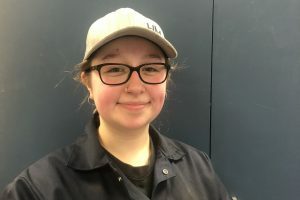 Congratulations to Mickaela who has started her apprenticeship while finishing her Foundations program in Automotive. In the Trades, you can earn while you learn! In Grade 11 or 12 and interested in the trades? Make an appointment to chat with Ms. Enns or your counsellor to explore your training options. Your first level of trades training could be paid for ITA before or after you graduate! Don’t see the trade you are interested in? See Ms. Enns for upcoming trades training in the region.